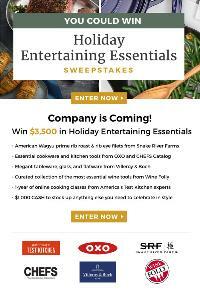 Prize: $1,000 in cash, CHEF Catalog $500 gift card, Villeroy & Boch $500 gift card, Snake River Farms American Wagyu Gold Grade Bone-in Prime Rib Roast, (4) 8oz. Snake River Farms American Wagyu Ribeye Filets, + cookware and bake sets ($3,775). Statistics: This contest was opened by 36 and entered by 9 ContestChest.com members. 25% of those who opened the contest, entered it.